Ministers, MKs join event at Samaria community abandoned and razed in Disengagement. Thousands celebrated a Pesach-time gathering Wednesday at Homesh, in Samaria, which was torn down and abandoned in the ill-fated 2005 "Disengagement." 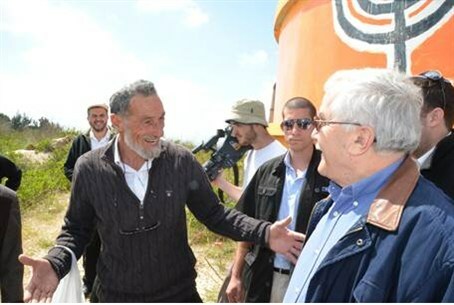 Visitors included Minister of Agriculture and Rural Development, Yair Shamir; Deputy Defense Minister Danny Danon, and Finance Committee Chairman MK Nisan Slomiansky. Min. Shamir (Likud / Yisrael Beytenu) said that "In the struggle vis-à-vis the practical people, the people of faith will always be victorious. May we always be people of faith and see rebuilt homes in Homesh, with children at play and a community that is standing on solid foundations. This is our land, period." Danon (Likud / Yisrael Beytenu) said that "Everyone understands, as do I, as Deputy Defense Minister, the importance of Homesh and the communities. The real Iron Domes are the communities here in Judea and Samaria. Thanks to these communities, here, there is security in Tel Aviv." MK Slomiansky (Bayit Yehudi) said that "Homesh is an inseparable part of the Land of Israel." MK Moti Yogev (Bayit Yehudi) thanked Samaria Regional Authority head Gershon Mesika and the Dean of Homesh Yeshiva, Rabbi Elishama Cohen, for "safeguarding Homesh with their own hands throughout the year." MK Orit Struk (Bayit Yehudi) said, "At the place where we stand, there stood a flourishing community that was uprooted and razed to the foundation for no reason. Everyone now understands what the Disengagement was, and mistakes must be rectified." Mesika said that "The ascent by thousands, at Chol Hamoed Pesach [the six days that separate the first and second Pesach holidays, ed.] is meant to point the new government in the right direction. We expect the government to change its course, and Homesh is a good start." The head of the grassroots Samaria Residents' Council, Benny Katzover, said that attempts to rebuild Homesh must be redoubled. "Visits by ministers, MKs and rabbis to the place bring us closer to it, and so, certainly, does a great cry by the public that loves the Land of Israel, that we want to renew the settlement enterprise that was razed without a reason and without any benefit." The event was organized by the Samaria Regional Authority and the Samaria Residents' Council, as well as Matnas Shomron and the Center for Memorializing Gush Katif and Northern Samaria.